This project is to construct a high school science laboratory building in the town of Gondar, Ethiopia. 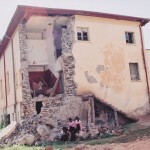 The existing laboratory building is partially collapsed as seen on the picture below, making it unusable and the laboratories are closed since 2009. This project is to demolish the existing old building and replace it with a building sufficient to house the biology, chemistry and physics laboratories in its place. This high school serves over 4000 students attending in half day shifts due to lack of class room facilities. This project is needed to enable thousands of students get the basic education they need to prepare them to pursue higher level learning. Without the laboratory, these students are at a disadvantage to graduate from high school with sufficient knowledge to enter the universities and colleges. The cost of this project is estimated to be $150,000 (USD). The Ethiopia Project is a local non-profit located in the Portland/Vancouver area whose mission is to collect, sort, and clean gently worn athletic shoes and deliver them to needy runners in Ethiopia. In March of 2010 we delivered more than 1500 pairs of running shoes in our first trip. 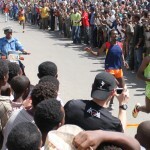 We met hundreds of runners and organized running races in three cities including Gondar. The relatively large number of runners and spectators participated in the race makes it one of the memorable events in our first trip to Ethiopia. As the Ethiopia Project continues to deliver running shoes and help a large number of runners to develop their talent, the numbers of runners that will make it to the finish line are very few. However, the remaining want to be runners that will not make it go to this high school in pursuit of education. By helping build this laboratory building, the Ethiopia Project will not only help needy runners get their basic high school education but a large number of needy minds for generations to come. Therefore, The Ethiopia Project added education to its mission since it is fundamental, long lasting and the need is far greater and reaches far greater number of young minds for years to come. The Ethiopia Project is a volunteer driven corporation that depends on its local community and business leaders for success. Volunteer opportunities include sponsoring fundraising events, Run-Your-Shoes-Off event as well as Dinner & Auction events. We also accept monetary and other donations such as auction items. We are a 501(c)3 and are happy to provide a statement of donation for your tax-deductions. If you are interested you can send an email to ep.volunteer@gmail.com or visit our web site at http://ethiopiaproject.com//volunteer .If you have any questions don’t hesitate to contact us at ep.andrew@gmail.com or ep.berhanu@gmail.com.